Like a child I have not forgotten a promise. This is still October and I did say I would try to colour spot some photos as part of p4oi. Today I have one for you. I have posted fewer of these ‘spot colour’ attemps because they are more difficult than I first realised and take quite some time and very steady mouse control. I actually think that apart from my very first attempt that they look like I had the crayons out. I have followed the same instructions each time as far as I can. None of the layout diagrams seem to match the version of photoshop in my computer. It is enough to make anyone give up, but I have no intention in doing so! 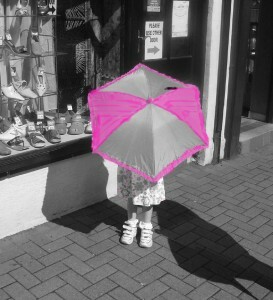 This little lady I met with her grandmother as I went in search of men in skirts! A very lucky young lady indeed. This photo was taken the second time I met her that day. Earlier she was in t-shirt and shorts. Here she was sporting a new dress that granny had bought. I wish I had a kind granny to take me shopping for nice new clothes. As I went on my way I thought of childhood, adults chatter and of promises. Sadly we remember the unfulfilled promises of childhood. Simple things that adults dismiss and say ‘Yes’ or ‘Of course darling!’ and continue with whatever they are doing and never give it another thought. We adults often carry on a conversation ignoring a child within earshot or in the room. We think they are paying no attention to what we are saying as they play about with their toys or watch TV. They sometimes pick up half a sentence or their own interpretation of what was said and not the real message behind whatever was talked about. We can unwittingly feed them with fear, teach them language that we might not like them to use, or indeed situations way beyond their understanding. This entry was posted in Children on October 18, 2008 by Grannymar.